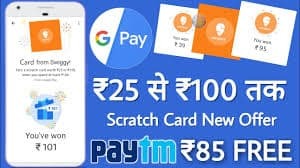 You can get Scratch Card from Rs.25 to Rs.100 on Txn of Rs.100 on Swiggy with Google Pay. You have Spen Rs.100 on Single Transaction on Swiggy to avail this offer. How to Get up to Rs.100 Back on Swiggy with Google Pay? 2. Choose Your Favourite Restaurant. 3. Now, Choose Food and Add to Cart. 5. Now, On Payment Page, Choose Pay with UPI Id. 6. Enter Your Google Pay UPI Id and Pay with it. A. Customers will get a cashback of 100% up to Rs.150, applicable to first time user of Amazon Pay on Swiggy in Dec’18. A. Offer is valid only on 29th Dec – 31st Dec, both days inclusive. A. The offer can only be availed once per user during the offer period.